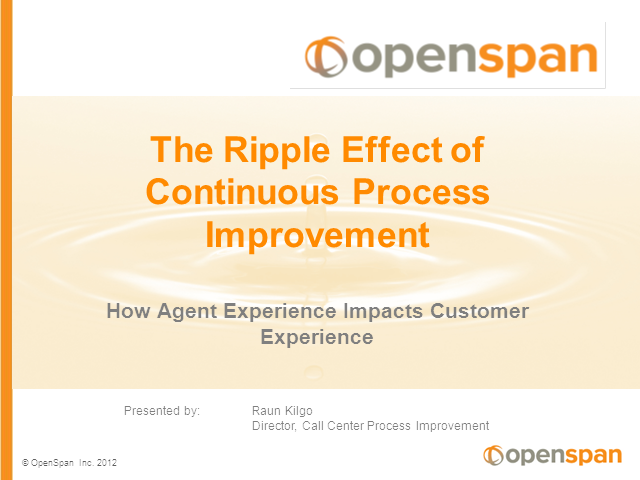 Join OpenSpan's Director of Process Improvement Raun Kilgo as he discusses - The Ripple Effect of Continuous Process Improvement - How Agent Experience Impacts Customer Experience. Any Human Process Can Be Improved As Is. Raun recently spent a day with CCNG members and attendees of the Optimize event discussing this topic and helping contact center management understand keys to improvement for the Agent and the Customer Experience.